That's right. My Christmas Dresdens quilt is now a pattern! Just in time for the holidays! This quilt makes me so happy to look at so I'm excited to share all the details with you. 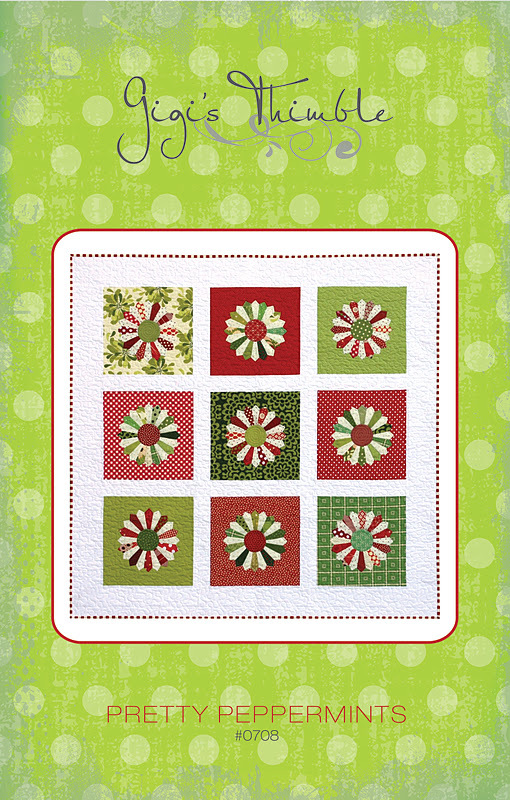 Pretty Peppermints is the perfect new twist on an old-fashioned block. Pre-orders are now available in MY SHOP. All orders will ship next week. Congrats :) I love the look of this one..my Mother loved Christmas and if she was still with me, I'd want to make her this one! Just ordered it ! Thanks, it will look so fun at Christmas for years to come! Yay!!! I want one really really bad...will need to get one quickly. Have admired yours ever since I first saw it. I received your 5" square of fabric!! give a way date, I will disclose my plan. It's ADORABLE Amber! I love the bright Christmas-y colors. And I LOVE LOVE that binding too -- it's perfect for such a cute quilt! This is a very sweet pattern. I think it's one I'll make but without the Christmas look. I'll make my peppermints mostly shades of white with blue specks ... maybe some dotty fabric. My dad always had peppermints in his pockets and it was always a big deal for his grandchildren to try to sneak one out of his pocket. It was always a fun game and a great means to interaction between them and my Dad. My Dad died 8 years ago and a quilt like this to cozy up under ... all those peppermints to remind me of him ... would make me very, very happy. It's definitely on my to-do list. That is gorgeous!!! I have always wanted to try Dresden plates. Love it! Absolutely GORGEOUS----Ooooh I am in LOVE with these!!! It looks so cute hanging in the shop! I especially love how tiny you made the dresdens, and I love your striped binding.